Louis Vuitton introduces the deluxe addition of the scented candles L’Air du Jardin, Île Blanche, Feuilles d’Or et Dehors Il Neige, created by Master Perfumer Jacques Cavallier Belletrud. Nestled in daring ceramic containers designed by Marc Newson, these 1,1kg candles travel easily from one room to the next thanks to a handle in hand-stitched natural leather, anchored by a metal rivet. 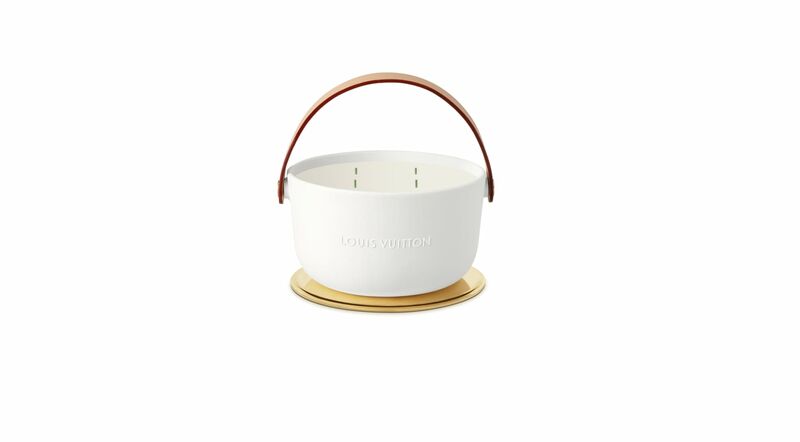 Crafted in Louis Vuitton’s workshops, the natural leather handle, an emblematic signature of the Maison, gives the candle its pure, nomadic character. An emblematic signature of the Maison, the natural leather handle is crafted in Louis Vuitton’s workshops and gives the candle its pure, nomadic character. Over time, delicate natural leather acquires suppleness and a unique amber patina. To embark on an olfactory journey, one can remove the gold-finished metal lid and place it underneath the candle, as a base. Discovering the fragrant wax with a colourful detail: four wicks, hand painted by an artisan wax maker in Grasse, France. Based in Grasse, Jacques Cavallier Belletrud imagines and composes each of his fragrances in his perfume laboratory at Les Fontaines Parfumées. In spring, when rose centifolia is finally ready for harvesting, its vaporous scent fills the air all around the Provençal estate. It slips into every rocky crevice with a singular softness. Jacques Cavallier Belletrud creates an ode to this May rose by casting it in an impressionistic light. Though the rose is one of the raw materials that can seem flattened when concentratedn in wax, here it appears without artifice, transparent and ethereal. The technical prowess behind this exercise: succeeding in simulating the weightlessness of this floral scent. This fragrance speaks of renewal and eternal refinement. Veils of white cotton whisper upon contact with the breeze. A murmur punctuates the afternoon siesta. Outside, the blues of the ocean and the sky strike the eye. The heat from the sun is too hot; better to take refuge in the shadow of chalk walls and watch as boats depart the shore in the far horizon. Île Blanche is an imaginary island, an archipelago of indigo and freshness, ocean spray and luminous rays. Jacques Cavallier Belletrud chose a fresh tea note to embody the contrast between the extreme purity of water and the incandescent sun. He also amalgamated a maté accord with orange, jasmine sambac from China, essence of neroli and cardamom. All the virtuosity of flowers are plunged into a bath of citronella and vervain. In just seconds, one feels calm, as if secluded on an island, with everyday cares thousands of miles away. A perfume that creates the impression of space and boundlessness. forests, where the exhalations of moist earth fuses with those of leaves and wood, Jacques Cavallier Belletrud pays homage to Indonesian patchouli. He offers a literal expression of the scent, softening it with the essence of Virginia cedar. A majestic forest takes root in the home. A sumptuous, vertiginous wood like those found in Asia. The essence of patchouli combusting brings a mystical depth. Subtle facets of incense, geranium, and Peruvian balsam wend their way into this imaginary forest. One feels enveloped by a sensation of security and ultimate comfort. A concentrate of pure force. 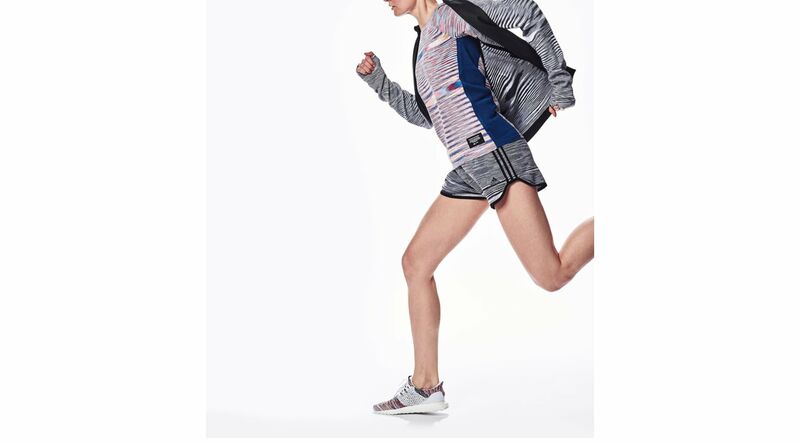 The iconic Italian fashion brand, Missoni has announced a collaboration with adidas Running, joining forces for the first time to create a line of performance shoes and apparel that celebrates the innovation and craftmanship of adidas brand, and Missoni co-founder and Olympic hurdler, Ottavio Missoni. 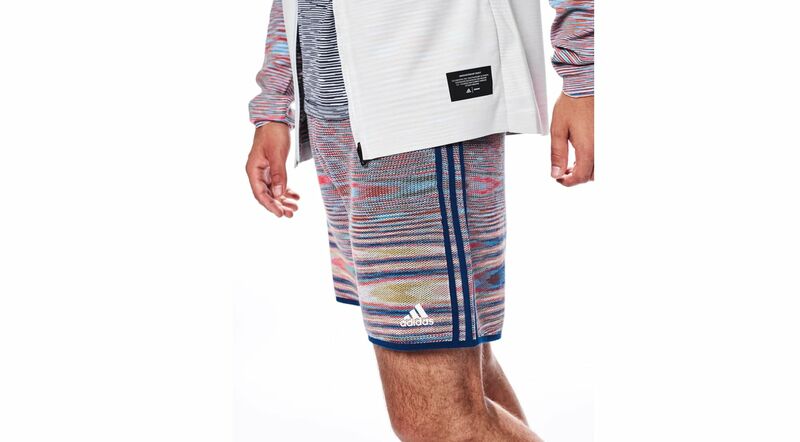 The creative collaboration is painted upon a rich canvas of history which refers to both brand’s roots, paying homage to adidas’s dedication to the craft of performance and Ottavio Missoni’s vision in fashion. Co- founder with wife Rosita of one of the most iconic brand in the world, the couple invented a new style made of kaleidoscopes of colours, unconventional patterns and innovative dying techniques which shaped the modern age of ready-to-wear . 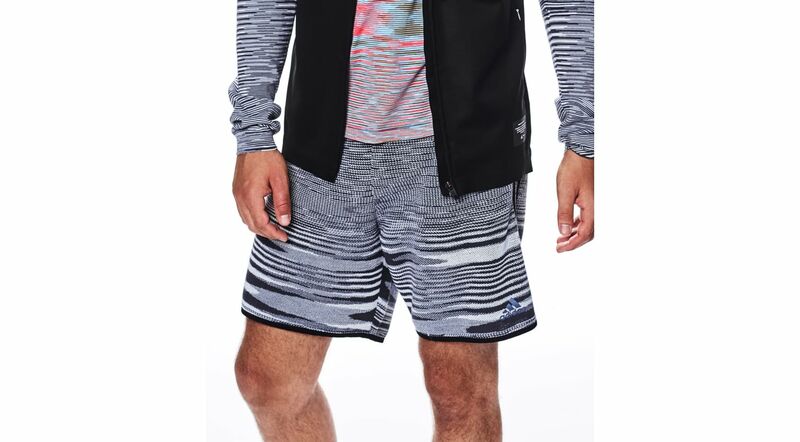 The adidas x Missoni range seamlessly blends Missoni’s world-renowned aesthetic with adidas’ focus on high-performance sports apparel, resulting in a limited-edition range that fuses together style and performance. The footwear features a collection of adidas’ iconic Ultraboost which incorporate Missoni’s trademark Space-dying technique on the knitted upper to achieve the iconic “flame” pattern which Missoni is renowned for. Meanwhile, adidas’ industry defining BOOST technology in the shoe’s midsole provides runners with optimal responsiveness and energy. 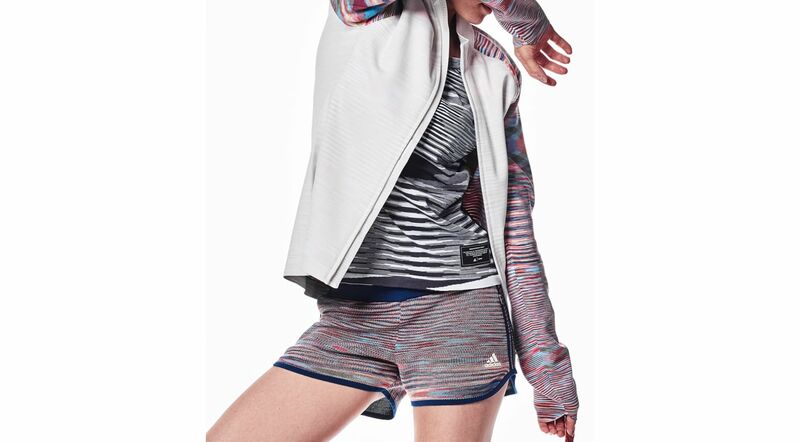 The range of apparel includes a cast of franchise running product brought to life via adidas Primeknit technology. 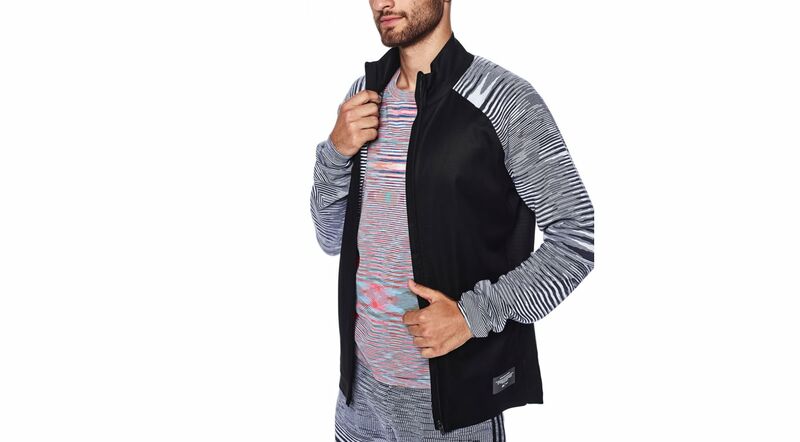 This range offers the runner a full ensemble with a Primeknit CRU short sleeve, a PHX Jacket that offers a weather protection and breathability, and the iconic Marathon 10 Short in a knit option all in two unique colourways – multicoloured and black and white – available for both men and women. 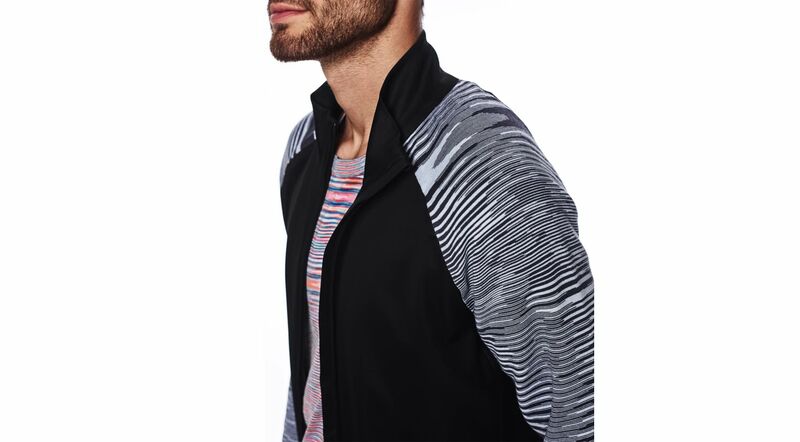 Showcasing Missoni’s Authentic credentials in the realm of athletics, founder, Ottavio Missoni, started his career as a runner then at the age of 16, going on to represent Italy in the 400m finals at the 1948 Olympics Games, London. Presently Ottavio’s daughter, Angela Missoni, is the Creative Director of the business and is committed to infusing the family brand with new energy, communicating new trends and ideas since 1997. 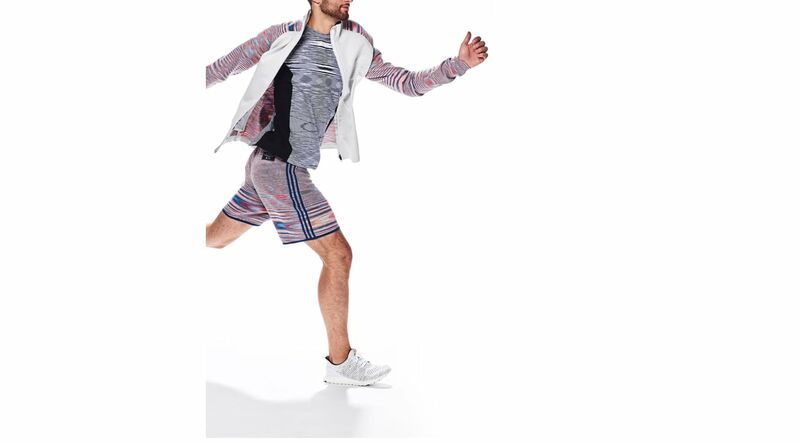 Shoes (RRP: €250) and apparel (RRP: €100 - €300) will be available to purchase from Missoni online and in-store April 23 and adidas.com April 25. 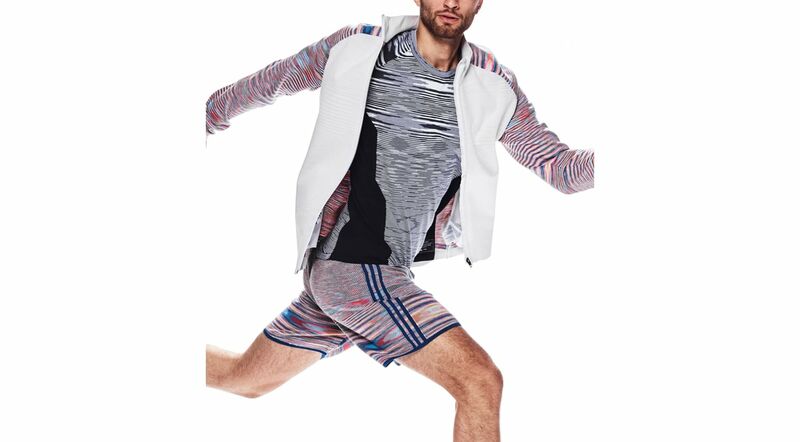 For further information please visit missoni.com, adidas.com/running or follow @missoni, @adidasrunning on Instagram or twitter to join the conversation. Be bold and striking with your own take on the camo style. 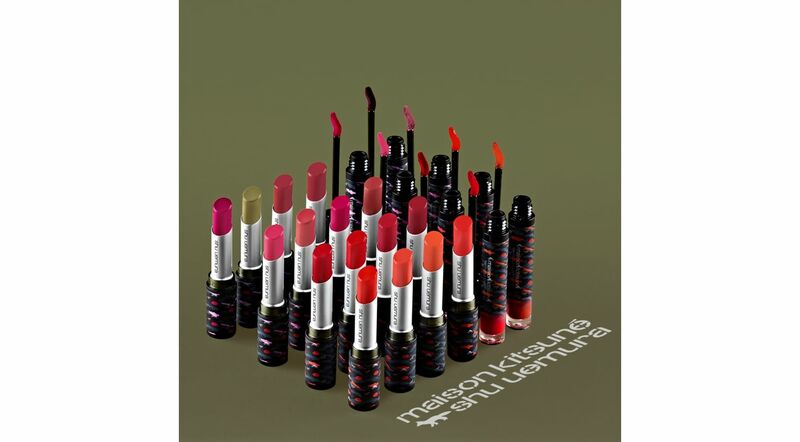 Maison Kitsuné and shu uemura are pleased to unveil their second collaboration for Spring-Summer 2019, a free-spirited and playful makeup collection inspired by the camouflage trend. 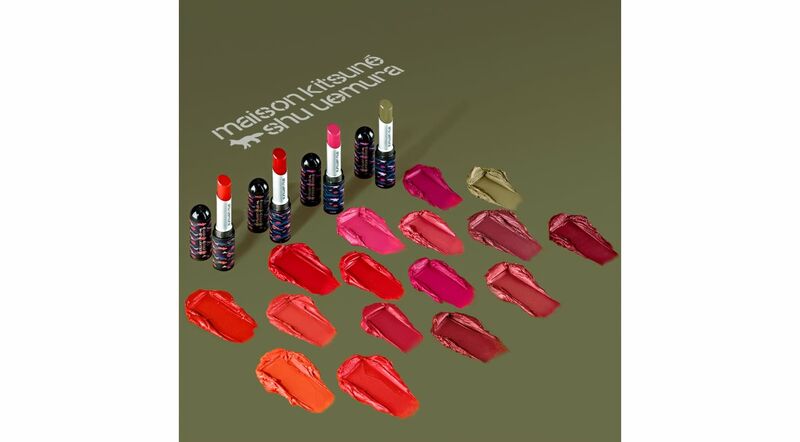 Putting a daring twist on this classic pattern, Maison Kitsuné and shu uemura have infused a dash of colors into the palette to create their own camo style. 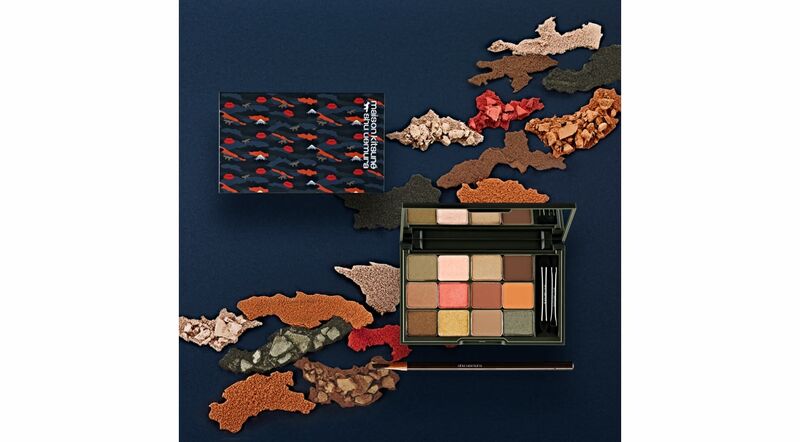 Composed of a 12-shade eyeshadow palette, lipsticks and a cleansing oil, #mycamostyle expresses a new interpretation of colorful shades and graphics for the eyes and lips. The exclusive packaging designed by Maison Kitsuné adorns the brand’s iconic “Camo Fox” print, playfully blended with vibrant colors and lipstick marks. Mix the on-trend khaki shades with the sun-torched shades to create your own unique camo look. Dare to try different stunning combinations of camo styles: blended with other shades or on their own, the colors create a bold statement and make you stand out, front and center. Show off your camo style and experiment with the colors to create your makeup look of the day! Following his quest to find the best craftsmanship from all over the world, which gave birth to the Africaba, the Mexicaba and the Manilacaba, Christian Louboutin went to Portugal, a source of inspiration close to his heart. 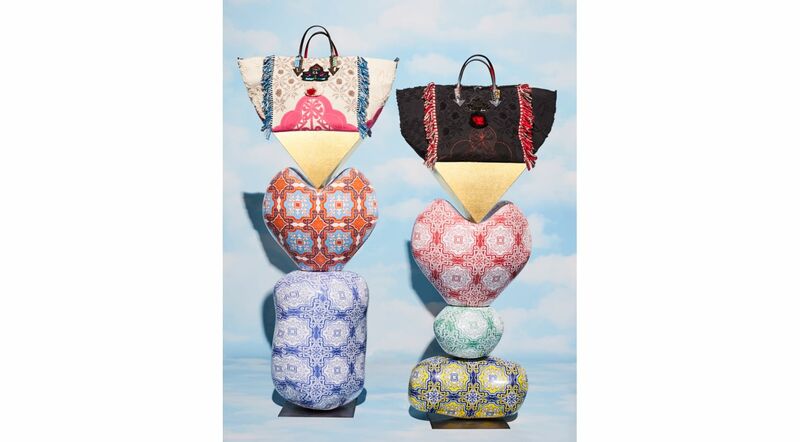 Creating a typically colourful celebration of the country that continues to inspire him, Christian designed the PORTUGABA putting his signature Louboutin twist on time-honoured traditional designs and showcasing artisanal savoir-faire. From the sun-drenched coast of the Algarve to the brightly tiled streets of Lisbon, Portugal conjures up vivid images, steeped in a rich history and graced with exceptional warmth of spirit. But that’s just the starting point. 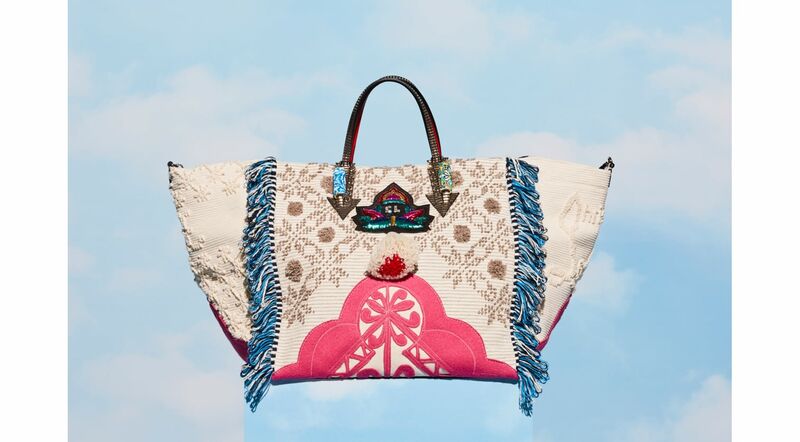 Each tote is a journey in itself, combining the talents of unique people from the four corners of the country, their stories and artistry woven into its very fabric. Each detail is a labour of love, borne from hours of work requiring precision, skill and most importantly, passion. From the beads on its handles to the fringing on its body and masterly mix of bold colours, the PORTUGABA is the ideal summer tote, combining form, function and timeless style. The journey begins in the municipality of Miranda do Doura in the north of Portugal, home to the Capa de Honra or Jacket of Honour. Typical of the region and perhaps one of Portugal’s oldest traditional costumes, the Capa de Honra is traditionally used to protect its wearer against the brutal climate of the mountains, the wealthier its owner, the more ornate and intricate the decorative details, the most common of which are cornucopias and hearts signifying wealth, abundance and love. Drawn to this unique art, local artisans continue the traditional technique, applying it to decorative objects slightly updating the designs to give them a more modern feel. In the Capa de Honra, Christian saw the ideal foundation for the PORTUGABA due to its durability and decorative visual appeal. Each panel takes around two hours to make, using a technique called picado which consists of cutting a complex pattern into the top layer of wool using only scissors – no patterns, no machines and no guides. Everything is done freehand and through instinct, or as artisans say, “with the eyes and the heart”. 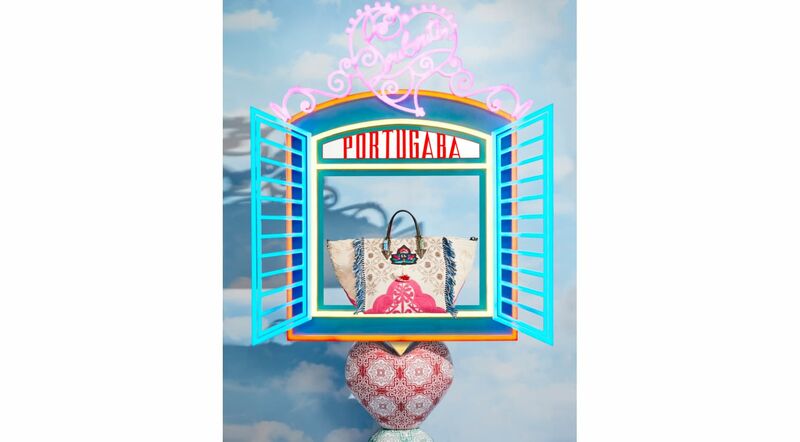 Turn the PORTUGABA to the right to reveal its signed Christian Louboutin side panel and you’ve landed in Fridão, a small village in north-western Portugal once home to the largest number of weavers in the region. The area is famous for puxados, a painstaking technique which involves pulling individual threads through a piece of fabric in order to create high and low reliefs with a look and feel similar to velvet. There are only a few puxados experts, who dedicate their lives and their art to tradition, which Christian wished to celebrate through the PORTUGABA. The left side of the PORTUGABA brings us to the women of the Cooperativa Tecedeiras de Cerva in the municipality of Ribeira de Pena. Working in cotton on traditional wooden looms, local artisans have over twenty years of experience in ripado and manteses, techniques typical to the region that involve manually pulling threads through the fabric, one by one, to create patterns in an embossed effect. Traditionally used to make cushions, tablecloths, bed spreads and attire, the panels take up to three hours to create, highlighting the savoir-faire which is so close to Christian’s heart. The PORTUGABA owes its distinctive tassels to the skill of weavers from Loures and Aboim da Nóbrega, who draw their inspiration from Portugal’s folklore and its traditional designs. Employing techniques such as puxados, overshot and riscado or stripes, artisans work in linen, cotton and wool but also silk, alpaca, cashmere and mohair. Their art is much more than a simple occupation. Much like Christian, it’s a consuming passion that they live out every single day. Each edition of the PORTUGABA is more than just a beautiful and timeless collectible. Instead, it’s a manifesto and a testament to the time, skill and artistry involved in authentic craft that Christian sought to honour by bringing the talent of these Portuguese artisans together. The story of the PORTUGABA is one of savoir-faire but more importantly of the people that make up the very fabric and history of Portugal. Finally, we come to the top of the PORTUGABA with its bead embellished handles and end up in the small village between Mafra and Ericeira. Each bead is created in the style of Portugal’s famed Azulejos tiles. Often seen covering the exterior of buildings, these centuries-old ceramic tiles bearing distinctive traditional patterns and designs are synonymous with Portugal. Each colourful pattern is meticulously transferred onto plastic and ceramic tiles or beads before being heat processed, with each piece taking almost an hour to complete. 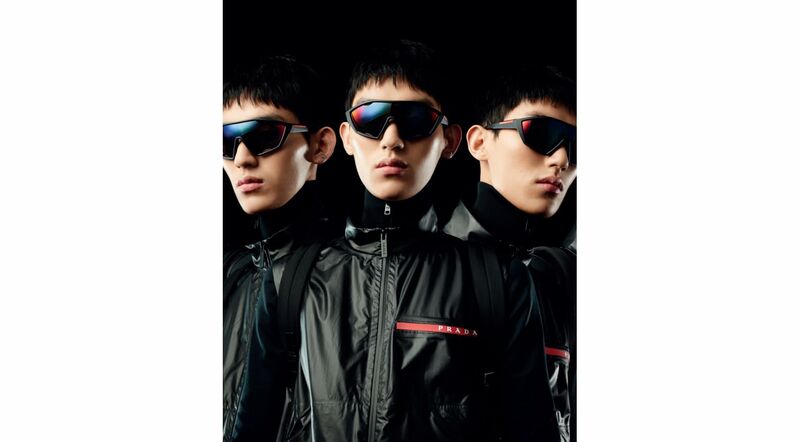 Milan, 18 April 2019 – Prada announces that the fashion show debuting the Prada Men's Spring/Summer 2020 collection will be held in Shanghai on June 6, 2019. 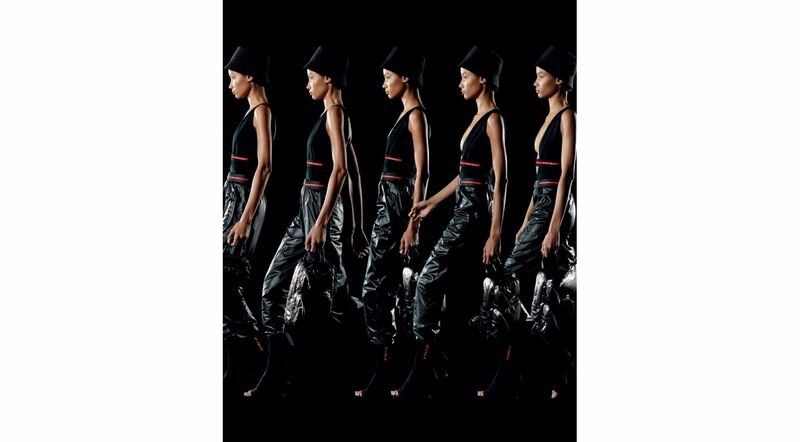 Staged during the 40th anniversary year of the twinning of the cities of Shanghai and Milan, this fashion show emblemizes a dialogue between these two diverse yet complementary hubs. Rong Zhai, a new cultural institution in Shanghai, housed in a historical building that represents the Group’s interest in both radical new architecture and historical preservation; Prada Rong Zhai was the venue for a second iteration of the Prada 2018 Resort show, in October 2017. 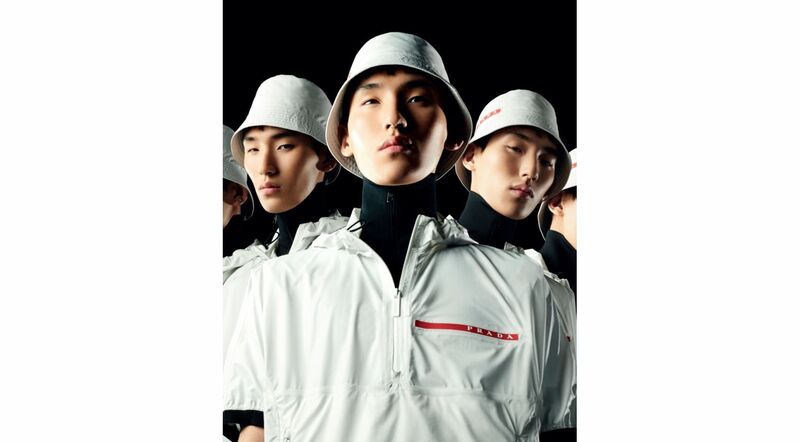 Prada’s remit in China includes continually expanding and emphasizing its presence with new and original experiences. 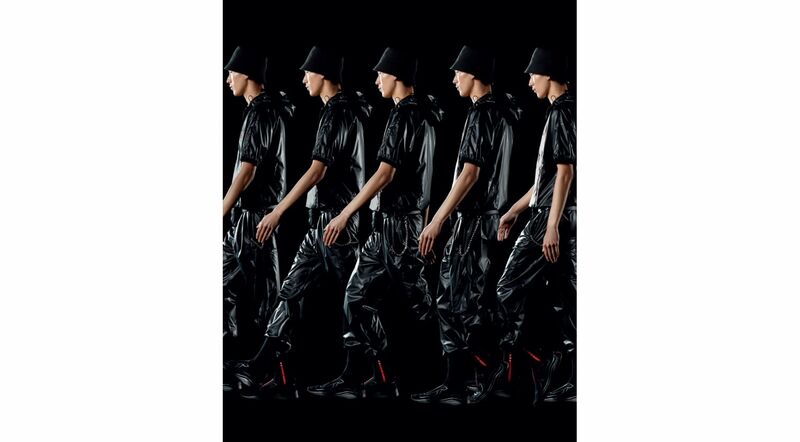 During Milan Men’s Fashion Week, to enhance the ongoing conversation between the brand's strong international vocation and its deep Italian roots, Prada will be present with two events: a live music performance on June 14th at Fondazione Prada; a presentation of the Prada Men’s Spring/Summer 2020 collection. NEW YORK, NY – April 18, 2019 –Polo Ralph Lauren is reimagining its iconic Polo shirt with Mother Nature in mind. Introducing The Earth Polo, crafted from thread derived entirely from recycled plastic bottles and dyed in an innovative process that uses zero water. 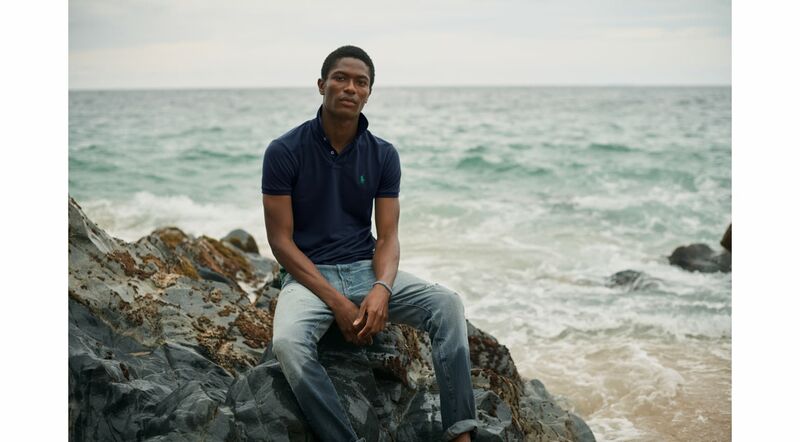 Each Earth Polo is made from an average of 12 plastic bottles. 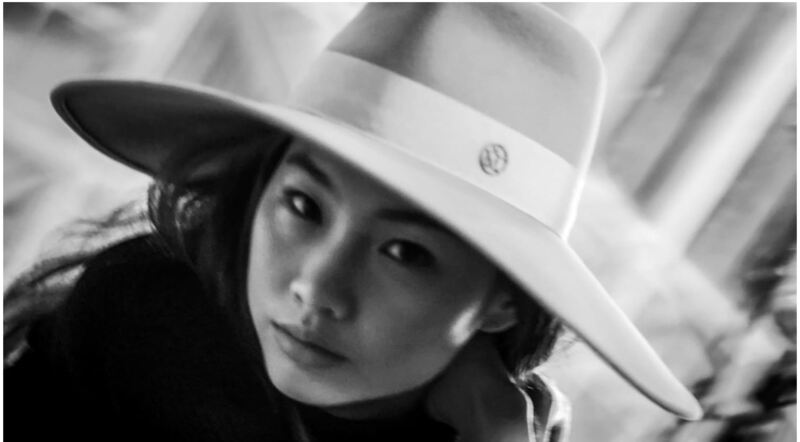 “Ralph Lauren will commit to removing at least 170 million bottles from landfills and oceans, and will convert the use of all virgin poly-fiber to recycled poly-fiber by 2025. Plastic waste is a major issue threatening the environment—we want to be part of the solution and utilize an innovative approach to create something valuable,” said David Lauren, chief innovation officer. The Earth Polo was produced in partnership with First Mile, an organization with a global mission focused on sustainability and positive social impact. First Mile works with entrepreneurs in low-income communities to collect recyclable plastic bottles, which are then processed through a unique and ecofriendly manufacturing program and turned into high-quality yarn and ultimately fabric. “When Ralph founded our company more than 50 years ago, he did so with the idea that whatever we create is meant to be worn, loved, and passed on for generations. It’s with this spirit of timelessness that we approach sustainability,” added Halide Alagoz, executive vice president, chief supply chain and sustainability officer. For decades, the iconic Polo shirt has been used as a global symbol to help raise millions of dollars for philanthropic and social impact, including funding breast cancer research and care through the Pink Pony Fund, raising funds for global disaster relief, and supporting the LGBTQ community. The Earth Polo will be available for men and women in global retail stores and on RalphLauren.com on April 18 in four colorways: Stuart Green, White, Navy, and Baby Blue. The company’s full Global Citizenship and Sustainability Report, including its comprehensive strategy and goals, will be published in June. The International Festival of Fashion, Photography and Fashion Accessories in Hyères has invited the Maison Michel to exhibit a sensorial immersion into its world in a specially erected structure at the villa Noailles for the duration of the festival. Large visuals dress the walls and the ceiling, to create a space that’s half atelier and half exhibition space. A multi-directional soundtrack plunges the visitors into the heart of the Maison Michel ateliers by playing the sounds of tools and conversations between the artisans. 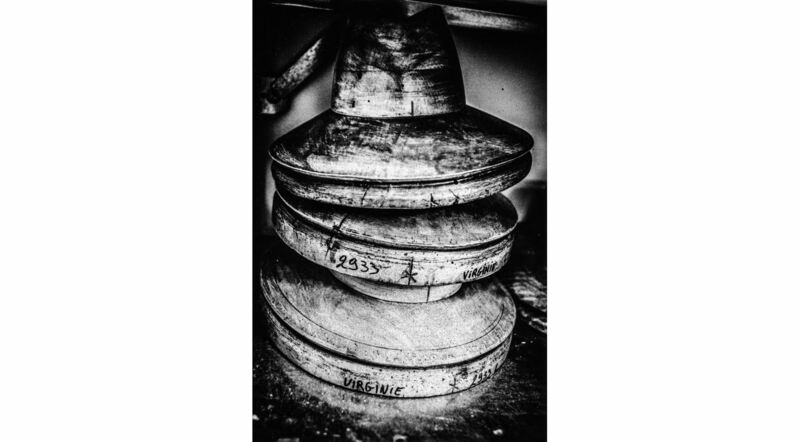 The centrepiece of the show is the collection of wooden hat forms belonging to the House (notably for the boaters, the fedoras and the wide-brim hats). 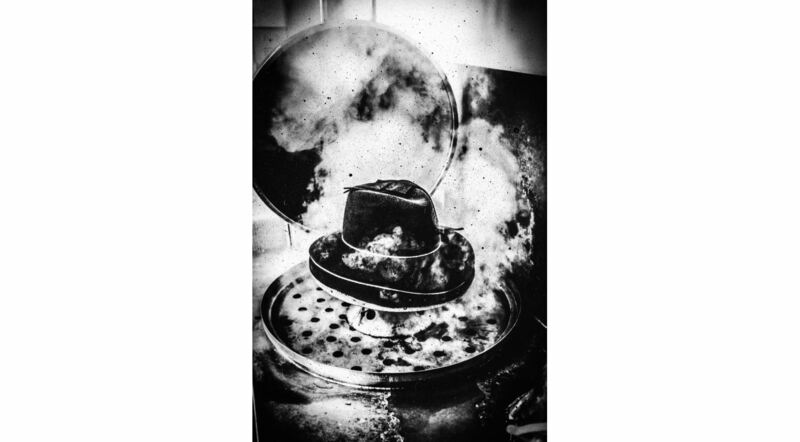 An installation of cathode televisions relays videos of the Maison Michel campaigns which celebrate the diversity of the creations made by the milliner. A way to highlight the role of the Maison Michel, almost like a hyphen between the preserving of their savoir-faire and their promising future. 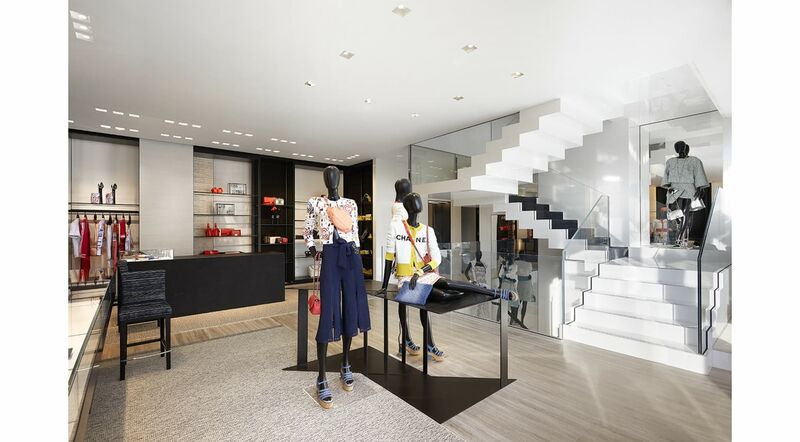 A luxury destination and a very special shopping stopover, from April 2019, the Principality of Monaco will be welcoming a CHANEL double boutique, dedicated to fashion and to watches and fine jewelry. Two adjoining addresses united in one new complex: the One Monte-Carlo. CHANEL has chosen to show two facets of the House, each one with its own identity, in an original architectural ensemble, accessible by two distinct entrances. Single yet double, its structure is cut up into spaces and asymmetric levels, that are by turns independent or interconnecting. 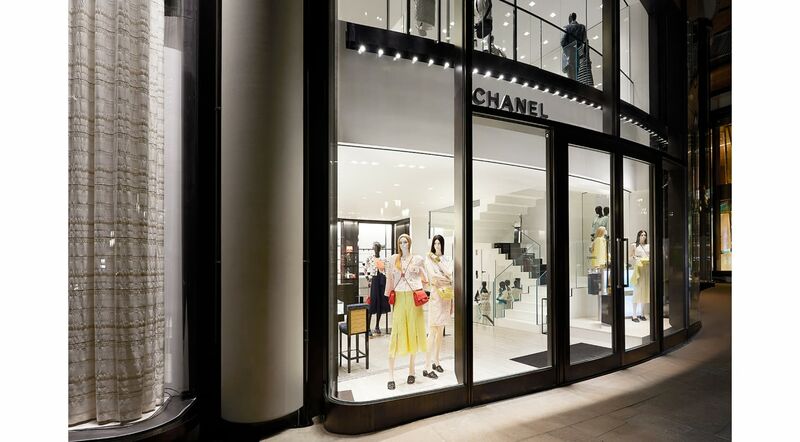 A building with contemporary and understated lines serves as the showcase for this CHANEL double boutique designed by architect Peter Marino. On both sides of the façade, French windows reaching the height of nearly 6 meters, soar to the upper level of the boutique. On the watches and fine jewelry side, behind the display cabinets, vast curtains woven by the House of Lesage retain the confidentiality of the space. 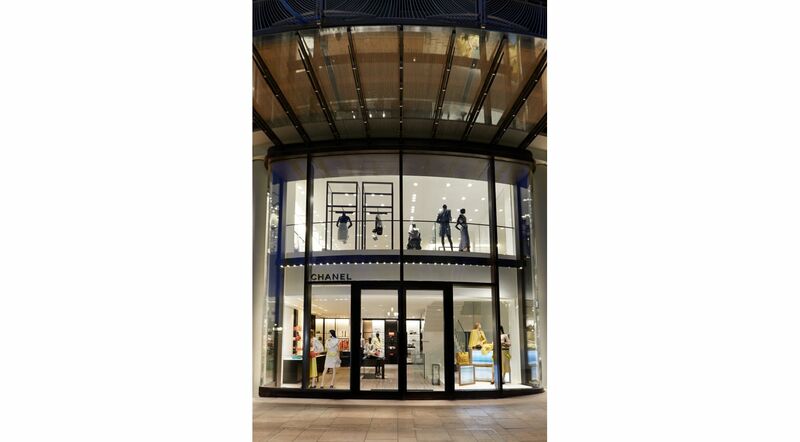 Conversely, on the other side of the building, the windows offer an uninterrupted view over the Ready-to-Wear and accessory collections. A difference in conception that transforms the interior of each boutique into a truly complementary and unprecedented shopping experience. 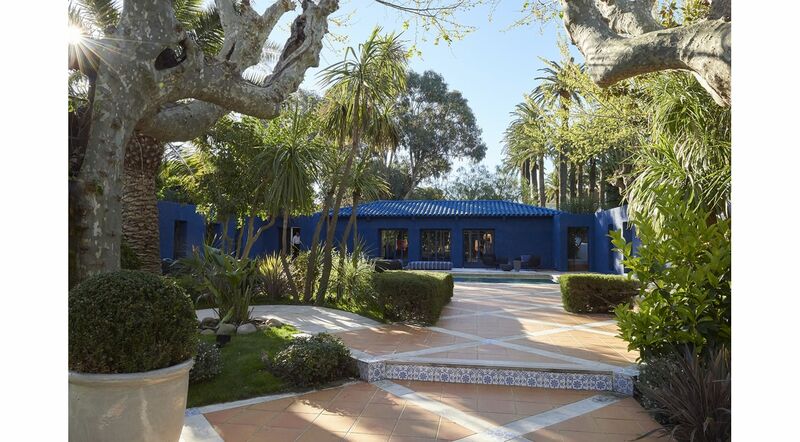 The codes of CHANEL and references to the life of Gabrielle Chanel are both represented: traversed by the design vision of Peter Marino and the House’s taste for art, they blend naturally into the peaceful atmosphere and the art de vivre of the Riviera. 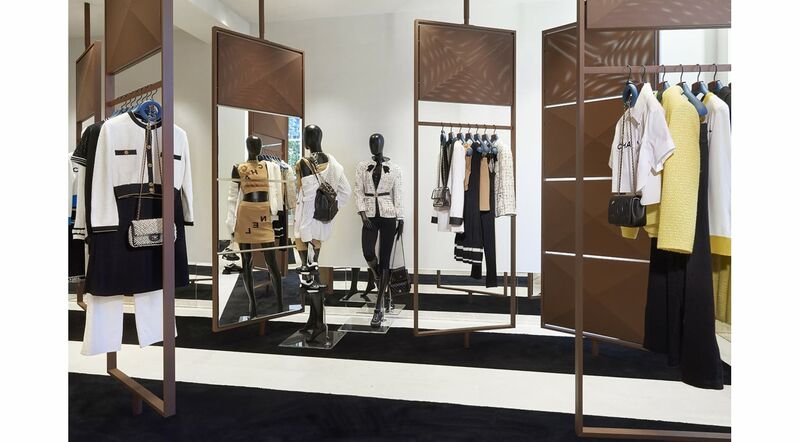 While independent on the ground floor, the two boutiques subsequently interlink on the floor above: each side is equipped with a lift veneered with mirrors and gold metallic mesh that lead to a shared upper level. 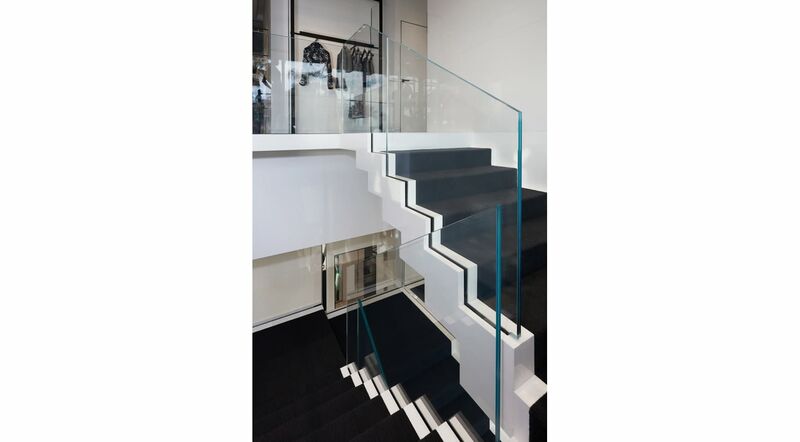 A dramatic floating staircase in white marble that is accessible only from the fashion boutique, also leads upstairs. Separated by a black parquet floored corridor decorated with four lithographs by Agnès Martin, the two boutiques are distinguished by their own mise-en-scene. Around the black lacquered counters, display cases and chairs in braided leather, the walls of the watches and fine jewelry space are swathed with a custom crackled Coromandel lacquer. 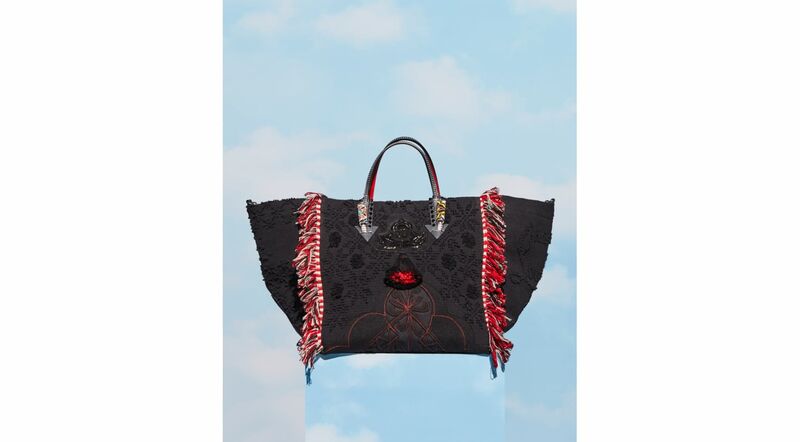 Its burgundy hues are reminiscent of CHANEL’s rouge noir and the garnet lining of the iconic bags. 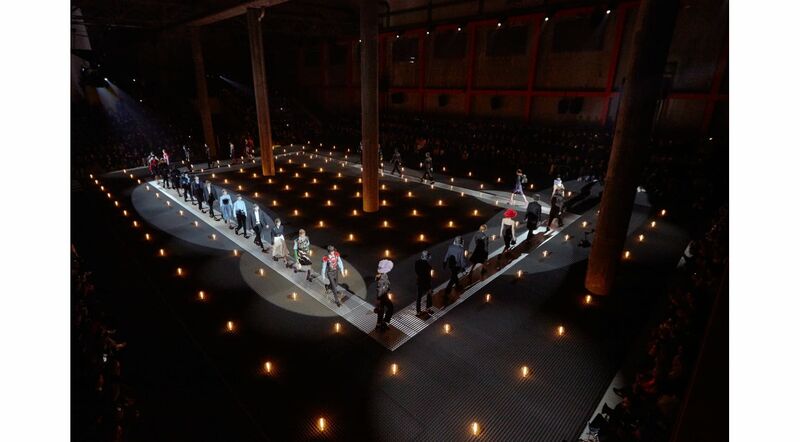 On the floor, a two-tone carpet belted with black parquet adopts the clean and graphic lines so dear to CHANEL. Protected from the exterior gaze, a salon adorned with a work by Vik Muniz representing Gabrielle Chanel hides beneath an archway. A décor that breathes intimacy in which to discover and try on the unique and exceptional pieces of high jewelry. The second part of the first floor is reserved for the fashion collections and features textured white stucco walls, interplays of materials and a luminescent palette of ivory and beige. The graphic effect is reinforced by the black parquet, covered in places with geometrically patterned rugs. 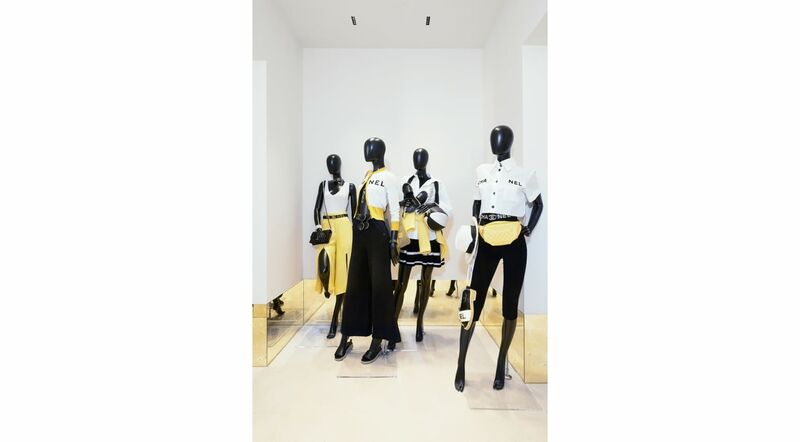 It is here that the Ready-to-Wear silhouettes from the Spring-Summer 2019 collection are presented, accessorised with the bags and the costume jewelry of the season. A double salon made up of sofas and armchairs in tweed spreads out in the centre. A metal and crystal screen by Christophe Côme dresses a mantlepiece. A coffee table by Michael Pohu in blackened engraved metal and a Wendell Castle chair complete the décor that is both contemporary and welcoming. A few steps away are three spacious fitting rooms finished in pale crackled lacquer for trying on the Ready-to-Wear pieces: inside, works by Peter Dayton and Shelter Serra revisit Mademoiselle Chanel’s emblematic camellia and pearls. 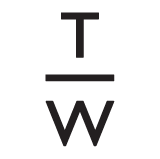 From the entrance to the try on rooms, the boutique presents 27 artworks by 19 different artists, all selected by Peter Marino especially for this location. Atypical in its construction, the new House of CHANEL in Monaco is home to a final space on the lower level of the fashion boutique. Accessible via an elevator and by the grand marble staircase, this lower floor adopts a fourth variation of the CHANEL codes: veined grey stone sliced through with black granite, two-tone patterned carpet, ribbed vinyl panels and pale textured walls which reflect the day light subdued by curtains. 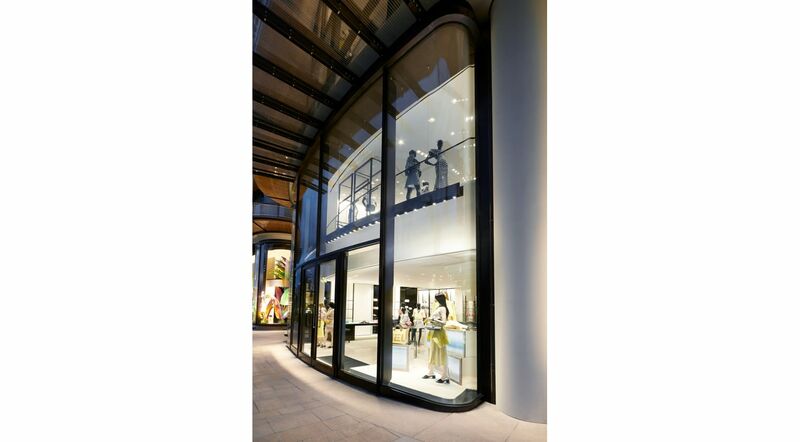 A tubular structure hung with blocks presents the costume jewelry adding a certain graphic dimension to the space. Further along, a salon enhanced with a Goossens chandelier is home to the shoes of the season: try the shoes while sitting on the leather and tweed armchairs, an ottoman or a sofa in tweed, installed by an ivory marble coffee table, a console table in crackled black lacquer topped with Goossens candelabrum and a mirror by the artist Curtis Jere. Inspired by the tranquillity and gentle pace of life on the Côte d’Azur, the CHANEL double boutique in Monaco opens a new door into the universe of the House. Its history is recounted through a modern mise-en-scene and its codes are delivered in a renewed yet instantly recognisable reading. From May 5th and during the summer months, open on Sundays from 12 noon to 7pm. 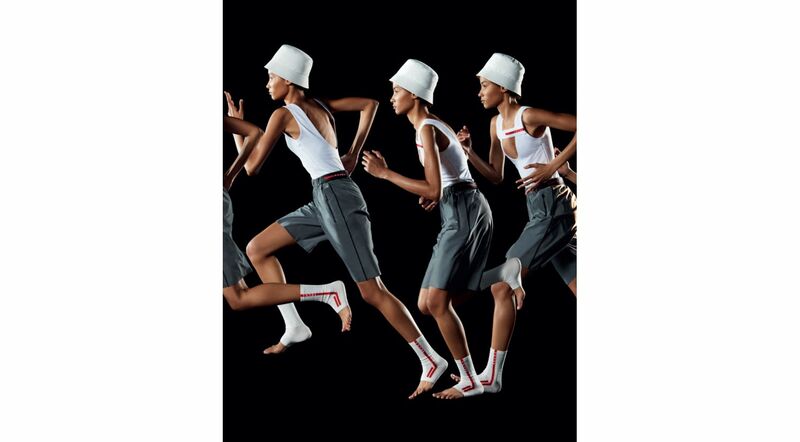 A new perspective, a fusion of sportswear and contemporary elegance: the Prada Linea Rossa Spring Summer 2019 collection features garments designed with avant-garde techniques and made of innovative, futuristic materials. Ultra-functional minimalism is the dimension of the collection that combines a design with sleek, pure, aerodynamic lines, high performance and a modern attitude. 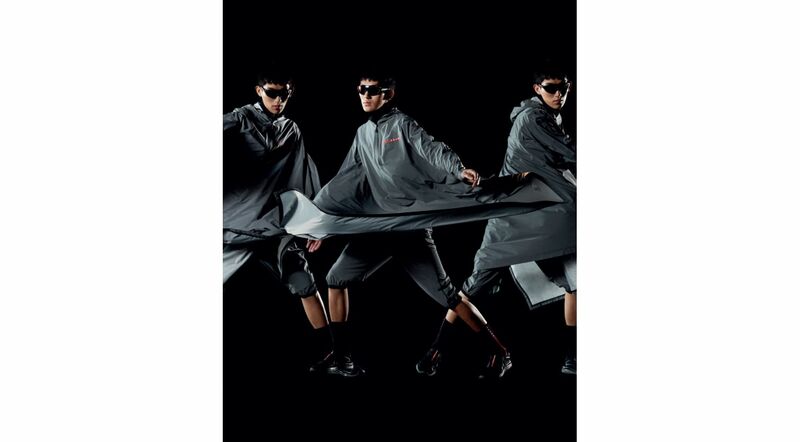 Breathable, elasticized and waterproof fabrics are a characteristic of Linea Rossa. The men's women's and unisex garments have relaxed or slim fit silhouettes to permit the best performance in any occasion. 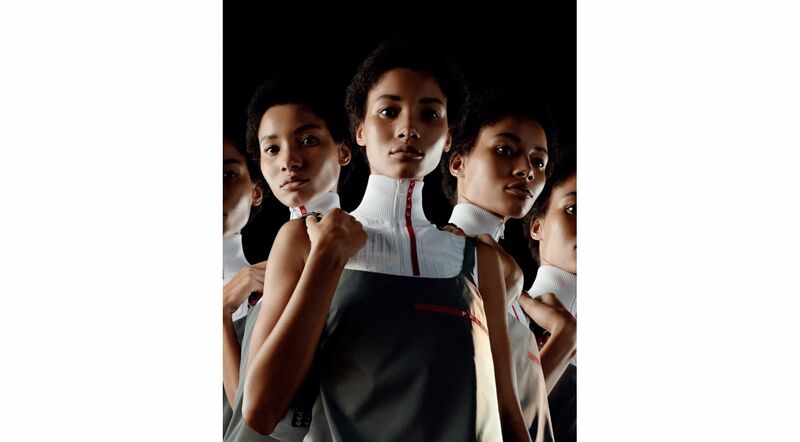 The Prada Linea Rossa digital campaign is a technoid take on the classic technique of chronophotography, which captures multiple frames of motion and combines them into a single image. 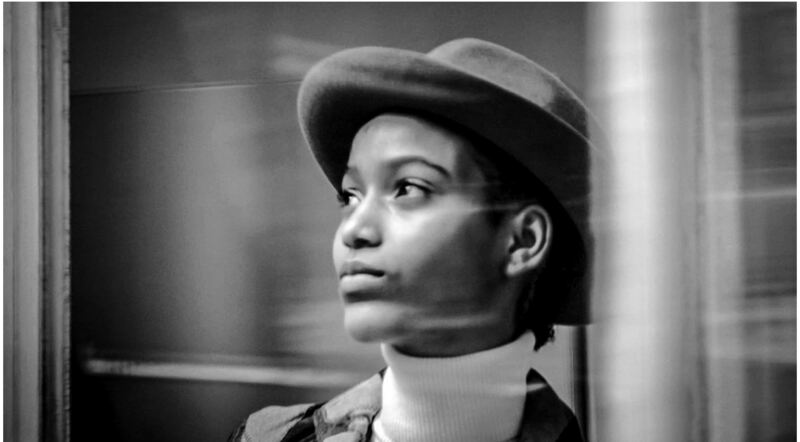 Lineisy Montero and Jun Young are the protagonists of the video in a succession of moments that reveal, as if in a parallel reality, the invisible energy of our daily actions and infinitesimal ways of being. Each year, CHANEL installs its seasonal summer boutique in Saint-Tropez at the La Mistralée townhouse in an exclusive décor inspired by the codes and the spirit of the House.The Spring-Summer 2019 Ready-to-Wear collection, the COCO BEACH de CHANEL line, the accessories, the perfumes and pieces of jewelry and watches are displayed in a serene atmosphere bathed in natural light. This season, CHANEL has chosen to combine classic interior design with ultra-modern furnishings. A floor paved with beige travertine welcomes the visitors and accompanies them with every step through the different spaces of the boutique. The unity of the floor is reinforced by a sense of infinity created by a game of antique mirrors positioned like high skirting boards, climbing walls painted in an understated white. Large black rugs contrast with this luminosity all while alluding to CHANEL’s signature black and beige two-tone. On one side of the entrance hall, almost like a prelude, a lobby presents a selection of eyewear and perfumes. The following room opens onto two series of large frames in a rust-hued metal. Set up in a chevron pattern, they carry the elegant yet casual Spring-Summer 2019 Ready-to-Wear silhouettes, inspired by the theme of the beach. In the midst of these frames we find large mobile panels, also in rust-coloured metal and double sided: their perforated plates dressed with a diamond quilting on one side and a mirror on the other. Bathed in sunlight, the conservatory is home to the accessories, the bags and the shoes of the season. As if in a dressing room, two large cabinets furnish the room. Quilted and perforated, through the transparency you can guess at the accessories displayed there: their shadows encouraging you to open each door and to peacefully discover each accessory. A blue suede sofa, poufs in tweed or suede are there for comfortably trying on the summer mules and sandals. Finally, several alcoves exhibit the CHANEL watches, including the J12 and the BOY.FRIEND watch as well as one of CHANEL’s iconic jewelry lines: the COCO CRUSH collection. 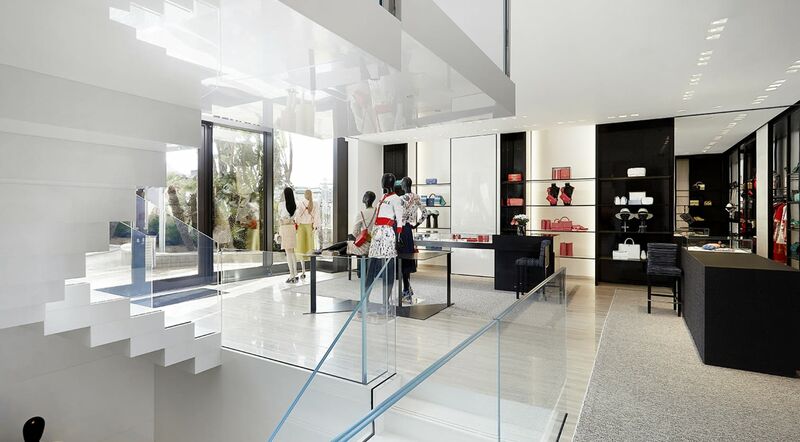 Like a breath of air in the heart of the effervescent village of Saint-Tropez, the new CHANEL seasonal boutique embodies all the relaxed elegance of the House, serene and radiant beneath the Riviera sunshine. 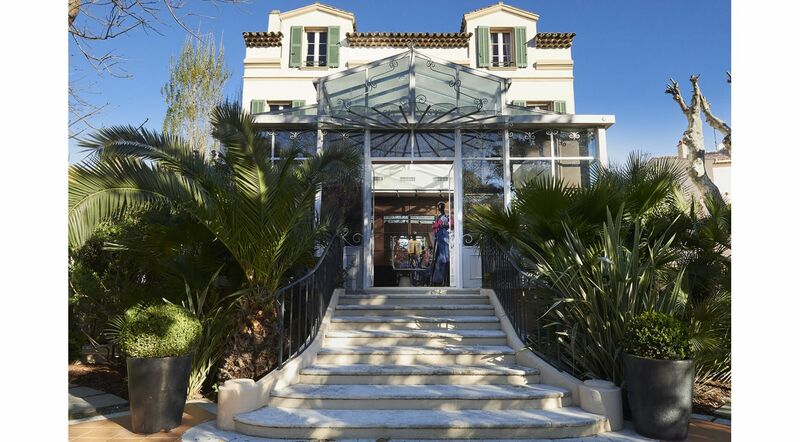 CHANEL’s seasonal boutique in Saint-Tropez opens its doors on April 5th and will remain open until October 2019.